Eyrignac et ses Jardins, at Salignac-Eyvigues, Dordogne, was one of the first gardens to open to the public, in 1987, at a time when there were very few to visit in France. 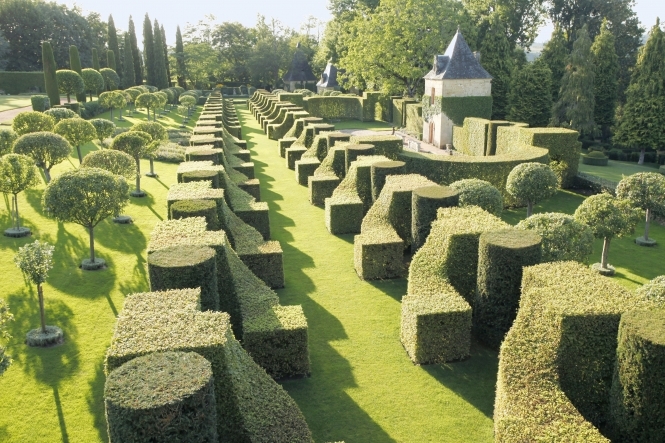 It has now been open for 31 years and welcomes 81,000 visitors a year to its 10 hectares of garden which is best known for its topiary and Jardin à la Française. There are 50,000 box, yew and hornbeams as well as cypresses and trained ivy, sculpted and tended to create a garden, dominated by shades of green, where everything down to the last detail, has been designed to create a carefully crafted aesthetic impact. This is no surprise as the garden was designed by a man who knew very little about gardening, but a great deal about style. Gilles Sermadiras, who drew up the plans for the garden, founded the lifestyle magazine Maison et Jardin and was a pioneer of garden furniture.